Wine of France. 60% merlot, 20% cabernet sauvignon, 20% cabernet franc. 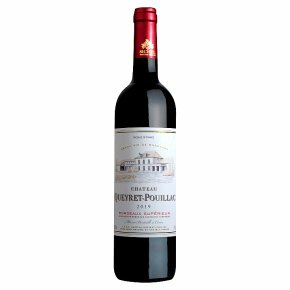 The Chateau Queyret-Pouillac has played an integral role in the history and identity of the Entre-Deux-Mers region - a region that is inextricably linked to wine production. The history of the vines and wines of this area goes back to the Middle Ages with the monks that planted vines here that went on to become renowned vineyards. Dark ruby colour with a generous fruity and spicy nose, a pleasant and full-bodied wine with a persistent structure. Serve at 17°-19°C, with grilled meat or blue cheese.